The Scotia Howard Weil 47th Annual Energy Conference will be featuring Keynote Speaker Bryan Milton, President of ExxonMobil Fuels and Lubricants on Growing Downstream Value. The presentation is in New Orleans. Presentation material is available for download below and a transcript will be posted as soon as it becomes available. 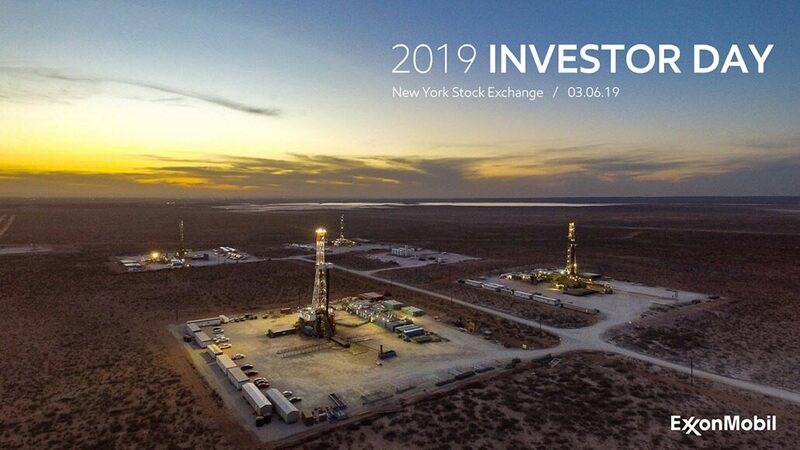 Organized by Goldman Sachs, featuring Keynote Speaker Darren Woods, Chairman and Chief Executive Officer of ExxonMobil on Value Investing. The presentation was held in Miami on Tuesday January 8, 2019. This material was presented at the company's annual Investor Day meeting, March 6, 2019. Please join Jeff Woodbury, Vice President, Investor Relations and Secretary, and Randy Powers, Manager, Compensation, Benefit Plans and Policies, for a review of ExxonMobil's Executive Compensation Overview, Energy & Carbon Summary and shareholder proposals via audio webcast at 10 a.m. CT on May 10. The webcast will last approximately one hour. All proxy materials, including the Executive Compensation Overview and the Energy & Carbon Summary, may be viewed here.